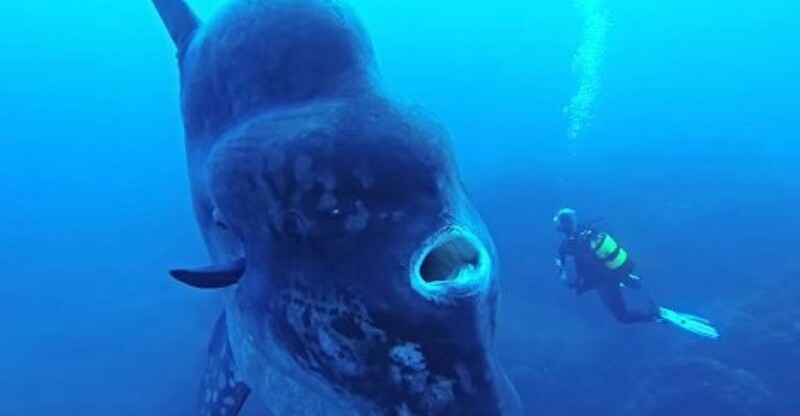 Meet The Underwater Creature Big Enough To Inhale An Entire Human Being! What’s the biggest fish in the world? Well, sizes of all species vary, but you can’t look much beyond the sunfish (or, to give it its Latin name – the Mola mola), a member of the order known as Tetraodontiformes. These things are giants of the deep and dwarf almost everything else in the ocean. The biggest sunfish ever spotted crashed into a boat off Bird Island off the coast of Australia way back in 1910. The thing was huge, measuring in at 4.3 m (14 ft) from fin to fin and 3m (10 ft) in length. It weighed approximately 2,300 kg (5,100 lb) too! They survive on zooplankton-type lifeforms and jellyfish, squid, Portuguese man-o-war, sponges and any other small fish that swim into their giant mouths. To see these aquatic mammoths swimming next to people is just insane. If you think you’ve some crazy things in the sea before – forget it. This is just breathtaking footage. Next articleWhen He Moved This Wood In The Basement Of His New House He Never Expected To Find THIS!